Our preschool starts the summer off right with our Adventure Camp which starts the Tuesday after Memorial Day. Adventure Camp will be offering 3 sessions of outdoor/indoor fun for children ages 3 – 6 at The Madison Community House Preschool. Camp will be held 4 days per session, 9:00 AM -12 noon. The program is an outdoor adventure in which we take advantage of our great playground and walking trips in town. Each day a different theme will be planned with fun outdoor/ indoor activities. Some possible themes include: water day, treasure hunt day, pet show day, carnival day, soccer day, bubble day, cooking day, bike rodeo day, art day and pizza day. Special programs and visits may include soccer coaches, drama/swim/cooking instructors or police officers. Children bring their lunch. Camp fees include all programs, trips, supplies and materials. The camp is open to all children who are in a 3 or 4-year-old program, Young 5’s and Kindergarteners. Adventure Camp is run under the direction of the Madison Community House Preschool Teachers. Come and join the fun! 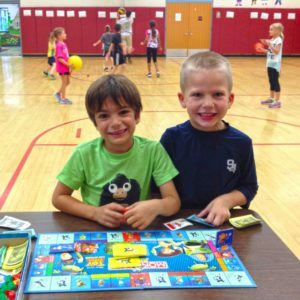 Then once elementary schools get out, our BASCC holds an eight-week full day Summer Camp Program 5 days a week from 7:00 AM – 6:00 PM starting June 24, 2019. You can sign up for all weeks or for any one-week period or daily period. Camp is held at the Madison Community House located at 25 Cook Ave. Madison. Campers enjoy a light breakfast snack, then participate in recreational sports and games, arts and crafts, cooking and sewing, hiking/walking, quiet time (board games and reading), afternoon snacks and drinks. On top of these offerings, each day a special activity is scheduled. Some of these are musical programs, library trips, swimming, movies, fitness programs and sports activities. To participate in either the full day or half day camp, all children must be registered with us. No registration fee is required for students already registered with the BASCC Program. A registration fee of $60.00 is required for all other students of elementary school age. For pricing and more details about the camps, please contact the BASCC Director; Dorothy O’Connor at 973-377-3105. New this year, we will be offering an eight-week half day camp 5 days per week with the hours of 9:00 AM – 1:00 PM also starting on June 24, 2019.